Now we proceed to consider the transformation induced by the Field of Attraction. This "transformation method", as the previous one, connected with the entering into the particle of excessive amount of Ether. As you already know the particles having Fields of Attraction are "responsible" for the process of gravity. And they can be attracted by the particles of any quality. 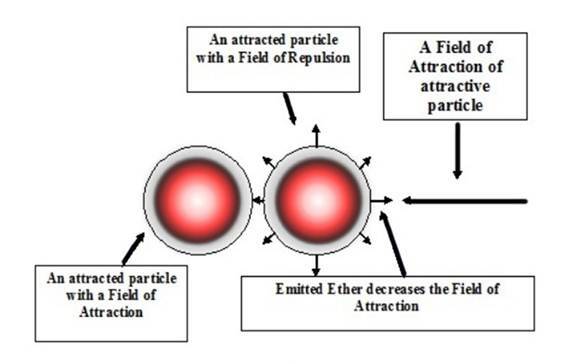 Transformation of the quality by Ether of the Field of Attraction occurs in particles with any external manifestation of quality - as with the Field of Attraction and with Repulsion Field. In that case, if both particles involved in the process of attraction have Fields of Attraction, each of them will be both the cause of transformation and experiencing it. Surrounding us with your world is the Logoic Plan, where particles of different plans are interconnected and hence of the different quality. The Logoic Plan is filled with all sorts of conglomerates of elementary particles. Among them, the most common type of conglomerate is a chemical element. Besides these, there are unstable particles, each of which is a mini-conglomerate. So, the transformation of particles by gravitation is best observed on the example of the chemical elements. But before turning to a conglomerate, let’s find out the cause of transforming influence of gravity on the example of two particles. At first let’s remind ourselves the mechanism of gravitational bond between particles. Let two particles with Attraction Fields interact with each other – i.e. “are connected" with their Fields of Attraction. The Zone of Destruction of each particle is immersed in the ethereal field and absorbs Ether from it. Let us recall that an elementary particle is filled with Ether, which is some kind of "ripple" on a "smooth surface" of Space. Also we recall that between Ether filling particle and Ether of the space is no difference and no boundaries. And so Ether of ethereal field is able to freely penetrate the particle and pass there through. Each of these two attracting particles Yin feels an action of the Field of Attraction of other neighboring particle. Each of these particles creates in the ethereal field of the universe deficiency of Ether. And as in this example, there are only two particles, then for each of them lack Ether produced by the neighboring particle is a single. And in the direction of this single deficiency of Ether creating by the neighboring particle, Ether of each of two particles tends to move, and hence the whole elementary particle. Attention! Now the most important in explaining of the mechanism of transformation by gravitation begins. Let's call one of the particles as transforming, and the other as transformed. A transforming particle necessarily must have a Field of Attraction (because here we are talking about the transformation by attraction). However, in this example, each of the particles is simultaneously and transforming and transformed. Along the line connecting the centers of both particles their Fields of Attraction are summarized. This means that for the surrounding ethereal field, these two particles are now single "deficiency" of Ether (but only along the line passing through the centers of both particles). 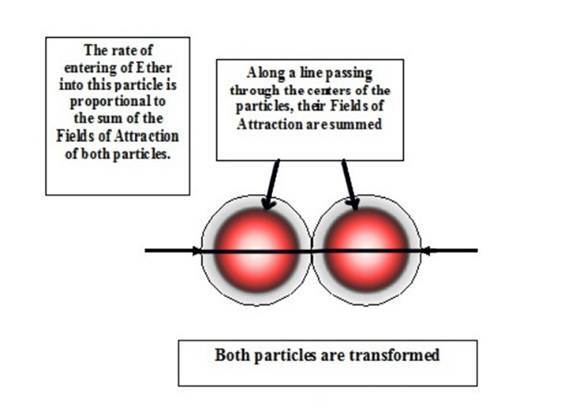 A transforming particle, located behind a transformed through the addition of its own Field of Attraction increases the rate of entering of Ether in the front particle - from its external side. I.e., whether a particle is single, Ether would enter into it at a rate corresponding to the value only of its Field of Attraction. And that's all. And there is no any excessive Ether. But in this case, two particles are coupled together. And an attracting particle "behind" of attracted like "works" for itself – i.e., the front particle "feels" a generated deficiency of Ether. But in the end it turns out that "the fruits of its labor" reaping the front particle (transformed) – the speed of entering into it Ether increases in proportion to the magnitude of the Field of Attraction of rear particle, that is transforming one. Thus, exactly a transforming particle is a cause of transformation of the particle in front of it. But as in our case, each particle has a Field of Attraction both are transformed, each with its own side. Transformation of the external manifestation of quality in attracted particle (as always in the transformation) is reduced either to a reduction in the rear hemisphere of the Field of Attraction (this is for the particles Yin), or to its disappearance and replacement by a Field of Repulsion (also for the particles Yin), or to an increase of the Fields of Repulsion (for the particles Yang). What will be the degree of transformation depends upon the velocity of the ethereal flow, that enters into the transformed particle (i.e., upon the magnitude of the total Field of Attraction) and upon the ratio of the rate of destruction and creation of Ether in the transformed particle. Transformation by gravity is no different from the previous "method" - transformation by movement. Decrease in particles Yin from their inner side of their Fields of Attraction or appearance of the Fields of Repulsion, as well as an increase in particles Yang the Repulsion Fields – this is, in the language of science, nothing else, as a reduction of the weight, mass. I.e. reduction that makes the particle tends to attracting it particle or to the conglomerate of particles. In the gravitating particles as they approach the Force of Attraction decreases. Occurrence or increase of the Repulsion Field in the particles on the inside side makes them grow apart to some distance. I.e. we can make a very important conclusion - between gravitating particles with a large magnitude of acting on them Field of Attraction an interval appears. I.e. a staying in part of a large conglomerate causes particles to move away from each other and from the common center. And there is closer to the center, the more the particles tend to move away from this center. This conclusion is very useful for us to understand what is going on in the bowels of any chemical element, as well as in the bowels of any celestial body. If the Field of Repulsion does not occur, but simply the Field of Attraction is reduced, then it is the weakening of the bond. However, in this process of distancing or weakening of the bond there are some limitations, operating according to the method of feedback. The more gravitating objects are moving away from each other (or the bond weaken between them), the less there will be the value of Attraction Field of each of them in relation to each other (distance effect). And accordingly, the smaller there is the degree of transformation. The smaller the degree of transformation is, the smaller are the Fields of Attraction or Repulsion arising (or increasing) in these objects. And then less they move away (or weaken the bond with each other). In reality, of course, there is not the process of "maneuvering" of the particles. They immediately in the process of formation of a conglomerate set a certain distance with respect to each other and the center. This distance is determined by the magnitude of the total Field of Attraction acting on each particle, and the quality of this particle (the ratio of velocity of creation and destruction of Ether). Exactly transformation by gravitation lies at the heart of this well-known in nuclear physics effect as "mass defect". Besides the transformation by gravitation is the cause of the phenomenon of radioactivity. And besides, exactly this "method" of transformation makes celestial bodies (stars, Nuclei of Galaxies, Nuclei of Super galaxies) emit elementary particles. The more particles with the Field of Attraction are located behind transformed particle, the greater is the total Field of Attraction, and the greater is the speed of entry of Ether into the front particle and the higher is the degree of transformation. However, not only the particle "on the edge" experiences the transformation. If on the line connecting the centers there are not two but several, each of them "experiences" the increased speed and pressure of the Ether and each will be transformed. Let's analyze on what factors depends the value of the degree of transformation of the particle. It is caused, firstly, the magnitude of the total Field of Attraction, which is composed of all the Fields of Attraction of all particles, "working" on the investigated particle. And, secondly, it depends on the quality of the transformed particle. Field of Attraction - this is an ethereal current, moving towards the particle absorbing Ether. The greater is the distance to the particle, the less is tendency to move in the direction of given particle with the Field of Attraction and the slower is a motion of Ether. I.e. an initial magnitude of the Field of Attraction of the particle decreases with increasing of distance to it. Therefore, the magnitude of each Field of Attraction of each particle, "working" on the investigated particle depends on two factors: an initial magnitude of Attraction Field of the particle and the distance from it to the investigated particle. It turns out that in any conglomerate the larger total Field of Attraction acts on the particles that are located closer to the center, and in which ethereal flow they get, rather than on the particles away from the center. The magnitude of the Field of Attraction - is the velocity of ethereal flow. The more is the Field of Attraction, the greater is the rate of entering of Ether into a transformed particle. It is nothing like a peculiar mathematical phenomenon. But it explains, for example, the cause of high temperature of celestial bodies in the center than at the periphery. Because of this Ether totally enters into the particles closer to the center at a higher speed than into the particles closer to the periphery. And, accordingly, the degree of their transformation is higher. Let’s observe, for example, a complex of five particles with the same magnitude of Fields of Attraction arrayed in one line. The degree of transformation of each particle depends on its position on the line. Let the magnitude of the Field of Attraction of each particle at a distance of location of adjacent particle corresponds to 5 conventional units. With increase of the distance the magnitude of Attraction Field decreases. Therefore, at a distance of two particles the Field of Attraction of the same particle will be less - 4 conventional units. In this case there are five particles. And we investigate the degree of transformation of the particle located in the center. From one end two particles are separated it and from other - also two. It’s symmetry. Let’s find the total Field of Attraction acting on the particle in the center: 5 conventional units we multiply by 2 (5 * 2 = 10), 4 standard units we multiply by 2 (4 * 2 = 8), 10 + 8 = 18. 18 conventional units - is the magnitude of the total Field of Attraction in an ethereal flow of which there is a particle in the center. This is the Field of Attraction plus its own Gravity Field of the particle – that is the velocity at which Ether enters into the particle on both sides. Into those two particles that are located on the second place from the edge Ether will enter at less total rate and therefore they will be transformed lesser as compared to the central particle. This is explained by the fact that the total Gravity Field of two second particles from the edge is smaller in the magnitude. Let’s multiply 5 conventional units by 2: 5 * 2 = 10. To 10 we add 3 and 4: 10 + 4 + 3 = 17. 17 conventional units - is the magnitude of the total Field of Attraction acting on the particles are located on the second place at the edge. This total Field of Attraction plus own Gravity Field of the particle – this is a rate of entering of Ether into these particles on both sides. The degree of transformation respectively will be appropriate. Into those two particles that are located at the edges Ether enters with the least total velocity, so they will be transformed at a least degree. This is explained by the fact that the total Field of Attraction acting on each of the boundary particles decreases. 5 conventional units plus 4 conventional units, plus 3 plus 2: 5 + 4 + 3 + 2 = 14 conventional units. 14 - is the value of the total Field of Attraction acting on each of two particles at the edges. The rate of entering of external Ether into the particles at the edge is 3 units less than into the particles on the second place, and 4 units less than into the particles in the center. The degree of transformation of the particles of the very edge is less on the same number of units. That's all. This was evidence that the closer is the particle to the center of the complex of particles, the more it is transformed. In the above examples the degree of transformation depends on the number of particles on the line and on the position of the investigated particle on the line (and, of course, on the initial magnitude of the Field of Attraction of each particle). The picture of transformation will be even more complicated if the initial magnitude ​​of the Fields of Attraction of particles on the line will not be the same, but different. And it will be increasingly difficult if we consider that on the line can be located not only particles with Fields of Attraction, but also particles with Fields of Repulsion. And this process of the transforming effect of particles on each other happens everywhere. Assess the scale of what is happening. Even one single particle with the Field of Attraction somewhere on the other side of the universe has a transformative effect on the particles of elements in your body. Even if this influence is negligible due to an unimaginable distance. But it still exists. A transformed particle can be not only the particle with the Field of Attraction, but with the Field of Repulsion. And if it is related to the holding and transforming it the particle with the Field of Attraction, then Ether will enter into it at high speed thanks to the Field of Attraction of the transformed particle that lead to transformation. However, the particle with the Field of Repulsion thanks to emitted Ether reduces in front of itself the magnitude of the Field of Attraction of the attracting it and "working" on it particle with the Field of Attraction. Because of this the rate of entering of Ether decreases and the degree of transformation decreases too. And the greater is the magnitude of the Field of Repulsion, the more it will weaken the effect of the Field of Attraction of transforming particle. A particle with a Field of Repulsion can never transform by the Field of Attraction any particle because it has no necessary for this – i.e. the Field of Attraction. Although, as we will analyze in the future, the particles with the Fields of Repulsion are greatly capable of transform other particles using their Fields of Repulsion. ------------------------------------------------------------------------------------Now consider again the mechanism of transformation by gravitation, but an example of a chemical element – a spherical conglomerate consisting of elementary particles of different quality. Any chemical element of the Mineral Kingdom (physics and chemistry explore namely the elements of this kingdom) is made up of elementary particles of only one Plan - Physical. The Physical Plan, as well as the Astral and Mental, is characterized by the fact that particles with Fields of Attraction are dominated in its composition. And compared to the Astral and Mental Plans the magnitude of the Fields of Attraction of the particles of the Physical Plan has the greatest value. Despite the fact that in the chemical elements of different types the particles of different layers of the Physical Plan are represented differently, in all elements of the Mineral Kingdom the particles with the Fields of Attraction prevail. From all this we can conclude the following - all chemical elements of the Mineral Kingdom initially a total Field of Attraction prevails over a total Field of Repulsion. Initially - that means out of the process of additional accumulation of elementary particles on the surface of chemical elements (for example, all the chemical elements of the Earth accumulate on their surface solar particles - photons). Therefore, in any chemical element initially a total Field of Attraction dominates over a total Field of Repulsion. And now back to where we started. Of course, in such conglomerate of elementary particles, where so many particles with Fields of Attraction combined, transformation by gravitation of the “rinsed” by Ether particles can not fail to occur. In any element always many other particles “works” on any particle. "Behind the back" of any particle in multiple directions there is always a huge number of particles that increases the rate of entering of Ether thanks to the joining of their Fields of Attraction. The total rate of Ether, passing through the particles and their degree of transformation increases towards the center of a chemical element. And for the same reasons that have been specified for a complex of five particles arrayed in a line. If we estimate the total Field of Attraction acting on an investigated particle from the side of all other particles of a spherical conglomerate, it would be dependent on the position of the particle in composition of the conglomerate. 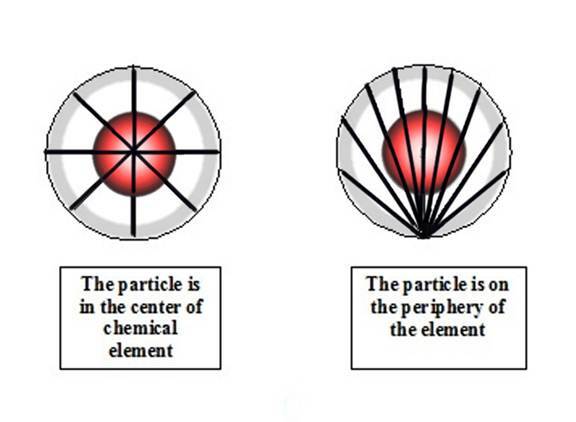 Compare, for example, a particle from the periphery of a chemical element with a particle from the center. Already we can immediately notice that between the particle from the center and any other particle of the conglomerate such large distances will bу not, as in the case of particles from the periphery. You can see that a large percentage of particles of the conglomerate is located from an investigated particle from the periphery at such distances that approach to the value of the diameter of the sphere. While the greatest distance for the particle from the center is not greater than the radius of the chemical element. A magnitude of the Field of Attraction, as we have often repeated, decreases with distance. We can talk about not only the transformation of individual elementary particles, but also the chemical elements. Since the elements are constructed of the particles too, their transformation ultimately also reduces to the transformation of the particles in them. About the features of transformation of chemical elements we will talk specially, in the separate book "Mechanics of bodies" when we talk about transformation of chemical elements forming the bodies. Here we should mention that the transformation processes occurring in the chemical elements take place and in celestial bodies. And elements and celestial bodies have a spherical shape and have many similarities in the structure, despite the difference in size.